You’ve put together a vacation rental listing and it’s time to get it posted. But are you sure it’s already the best it can be? What if you can still make it better? Luckily, it doesn’t take much to transform a so-so listing into one that will have guests scrambling to book with you. Aside from knowing what not to write on a vacation rental listing, knowing what info to include will help you stand out from the hundreds of other listings available. If you want people to hit the “book” button after reading your vacation rental description, here are the details your listing shouldn’t be without. A name doesn’t just identify your rental. It also makes your listing look more trustworthy, since a name helps guests search for your rental online and check whether it’s a good place to stay. 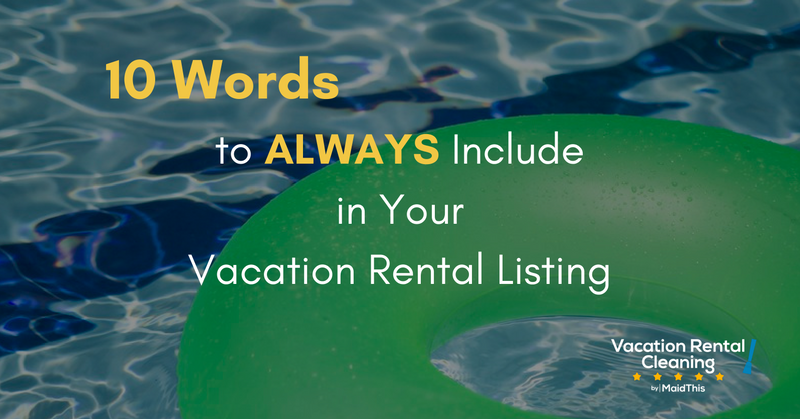 If you’re running your vacation rental as a legitimate business, make your name memorable (but not distracting) by mentioning it two or three times throughout the copy – but no more than that. As you can guess from the name, your USP is what sets you apart from the competition. For example, does your rental have a nice view of the sunset? Is it strategically located in the middle of shopping centers, parks, and other important establishments? Does it have more flat-screen TVs compared to other units? If you’re not sure what your USP is, take a look at your competitors’ listings. See what you’re doing better than them and play it up in your description. Think about the people most likely to book your rental. For example, couples will appreciate a place that has “romantic” written all over it, while parents will prefer amenities that’ll help them keep their kids busy. When you write for a specific group of guests (rather than try to cast a wide net), your listing will feel more personalized and attractive to the people you want to stay with you. It’s tempting to stick with tried-and-tested phrases like “breathtaking view,” “cozy house,” and “crystal-clear swimming pool.” However, keep in mind that most guests have seen those phrases a million times before, so they’re not likely to help your rental pop more than other listings. One caveat: Avoid overdoing the flowery descriptions or exaggerating the good points of your rental. As much as guests love to salivate over the idea of staying in an “idyllic villa,” they’d rather not get their expectations up only to get them shot down. Keep your descriptions fresh and original, yet sweet and honest. Of course, your description won’t be complete without mentioning what type of vacation rental your guests should expect from you. Is it an apartment, a condo, or a family-style home? By mentioning this bit of information, guests will be prepared to adjust themselves to your accommodation, and not do things like bring their 10-member family to a single-room place! You don’t have to mention every little detail about your vacation rental, like how many teacups are available in the kitchen. But your guests will want to have a clear idea of what day-to-day life will be like at your place. Give them a brief overview of what to expect. Use bullet points to list amenities; guests will find it easier to skim through the features they like and pinpoint those they don’t. Go through your list and ask yourself what you’d want to know about if you were a guest and write it down. Aside from the rental itself, you’ll also want to mention your favorite neighborhood spots. After all, location is a guest’s top consideration. However, be careful not to oversell those spots at the expense of your rental. Otherwise, your potential guests might pick other places to stay just to see that awesome hole-in-the-wall coffee shop you mentioned, which defeats the purpose of mentioning it in the first place! Before guests can find your listing, search engines have to do it first. For example, if your vacation rental is in Los Angeles, you’ll want to incorporate the phrase “vacation rental in Los Angeles” into your headline and/or description at least once. That way, you’ll increase your chances of ranking higher on Google when someone types that keyword into the search bar. But keep in mind that too much of a good thing can be a bad thing. Avoid overstuffing your description with keywords – make sure they’re inserted naturally into the copy. The more reader-oriented your vacation rental listing is, the better it is for Google. Some people advise against including rates on your listing. They prefer to write something like, “For rates, please contact owner,” so they’ll have more wiggle room to negotiate with guests. Besides, guests can filter listings by rate anyway, so there’s no point mentioning them, right? If you’ve been in the vacation rental business for a while, you should have a happy customer or two. Encourage them to give you honest, constructive reviews on sites like Airbnb, and ask for their permission to use those reviews in your listing. This way, when people see that you have loads of positive, thoughtful reviews from happy customers, they’ll expect to be happy with you, too. When it comes to vacation rental listings, more detail is always better. By using these 10 tips, you’re sure to craft a killer description. Go over your listing, include every bit of information that’s helpful for guests and proofread it for any mistakes. In the meantime, schedule an appointment with us. Our expert cleaners can get your rental ready for the next guest in line!